For the next few weeks, leading up to the publication of my book How to Celebrate Everything, I’ll be running a series on family rituals, all about the ways we build memories and infuse meaning into our day-to-day life with kids…usually through food. I can’t think of a better way to kick off the series than with Jackie Cuscuna, one half of the genius team behind Ample Hills Creamery in Brooklyn. 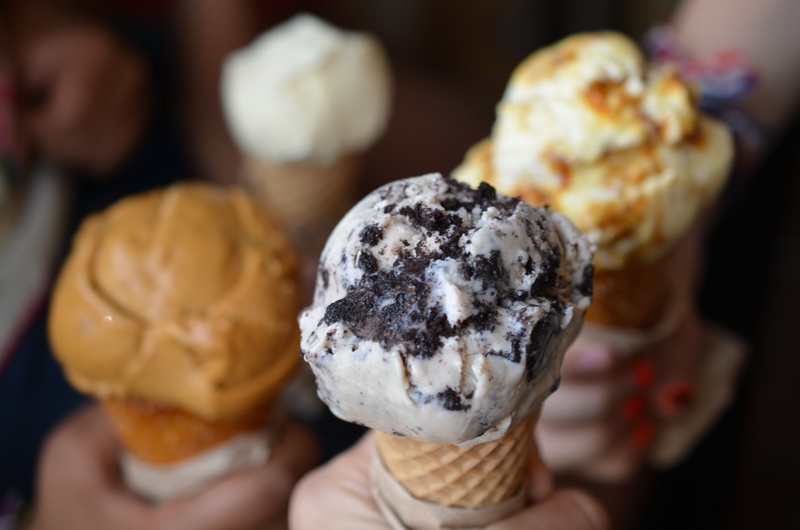 Ample Hills started as a literal mom-and-pop shop in Brooklyn in 2011 — the other half of the team is husband Brian Smith, their two kids are Nonna and Kaleo — and has expanded to a cookbook, a huge mail-order business, and seven locations, including Disneyworld. What accounts for their success? Well, I like to think it’s because they make ice cream into which is folded not just homemade, all-natural deliciousness (think from-scratch peanut butter cups and Rice Krispie treats) but stories, histories, and, nostalgia too. That is what Jackie is talking about today, and I’ll let her take it from here. Thanks Jackie! My mother got sick when I was pregnant with my first child. While she was in the hospital we talked a lot about the baby who would soon be a part of our family, the relationship she would have with her first grandchild, and what she wanted the baby to call her. 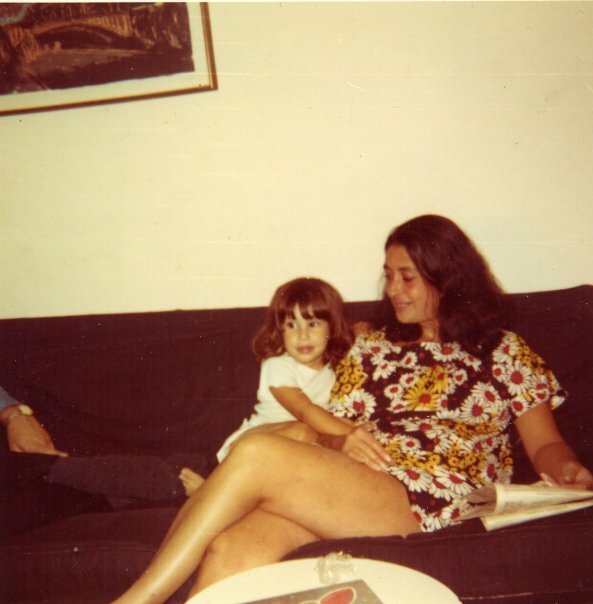 My mother first came up with the name “Nonichka” which sounded exotic to her and melded her Russian Jewish background with her love for Italy and my Italian father, and sounded distinctly different from the the name “Grandma” which she did not want to be called. I thought it was too complicated and long. We compromised and decided on “Nonna,” the Italian word for grandmother. She died before that could happen, but in her honor, we named our daughter Nonna. I don’t ever recall a time that my mother wasn’t making Oatmeal Lace cookies. Spending time in the kitchen and feeding people was one of her most favorite things to do. She was a psychologist and worked hard, so for her, cooking was relaxing. She loved big projects, welcomed complicated dishes, and thought nothing of taking on an Indian chicken with forty-five ingredients that would take three days to make. The cookies were no exception. I’ve never made them — my brother has taken on that role in our family — but they’re lace cookies, so they’re extremely delicate and extremely buttery, so it can be challenging getting them thin enough without burning or sticking to the pan. (My mom used foil, my brother uses parchment paper.) But the result is magic: If you do it right, they’re like two cookies in one, crispy and crunchy on the outside, and chewy in the middle. The guys at the shop bake the cookies differently since they have to be sturdier to hold up to to a frozen state, but it still smells the same. When there are new bakers, I find myself telling them the back story of my mom’s recipe. I want them to understand that there’s a significance to what they’re doing, that there is a deeper meaning, that it isn’t just making cookies to be folded into ice cream. How sometimes, the smell of those cookies make me so happy, but then on another day, without even knowing why, it makes me unbearably sad because I miss her so much. What’s amazing to me every time, though, is how tastes and smells can connect you to a time you thought you forgot about. It’s hard not to be grateful for that. Is there any doubt about why Jackie and Brian’s business is so successful? Thank you Jackie! As for the rest of you: If you aren’t lucky enough to live near an Ample Hills Creamery location, you can mail-order Nonna D’s Oatmeal Lace…or make it in your own kitchen. This recipe is from Ample Hills Creamery: Secrets and Stories from Brooklyn’s Favorite Ice Cream Shop. It has been reprinted with permission. Jackie and her brother would like you to know that if you want to bake the cookies separately (and not stir them into ice cream), in order to get the consistency their mom prided herself on (chewy inside, crispy outside), you bake between 350°F – 375 for 8 to 10 minutes. Make the brown sugar and cinnamon ice cream: Prepare an ice bath in the sink or in a large heatproof bowl. In a medium saucepan, combine the brown sugar, skim milk powder, cinnamon, and milk. Stir with a hand mixer or whisk until smooth. Make sure the skim milk powder is wholly dissolved into the mixture and that no lumps remain (any remaining sugar granules will dissolve over the heat). Stir in the cream. Clip a candy thermometer to the saucepan and set the pan over medium heat. Cook, stirring often with a rubber spatula and scraping the bottom of the pan to prevent sticking and burning, until the mixture reaches 110°F (45°C), 5 to 10 minutes. Remove the pan from the heat. Place the egg yolks in a medium bowl. While whisking, slowly pour ½ cup (120 ml) of the hot milk mixture into the egg yolks to temper them. Continue to whisk slowly until the mixture is an even color and consistency, then whisk the egg-yolk mixture back into the remaining milk mixture. Return the pan to the stovetop over the medium heat and continue cooking the mixture, stirring often, until it reaches 165°F (75°C), 5 to 10 minutes more. Transfer the pan to the ice bath and let cool for 15 to 20 minutes, stirring occasionally. Add the vanilla and stir to combine. Pour the ice cream base through a wire mesh strainer into a storage container and place in the refrigerator for 1 to 2 hours, or until completely cool. Make the oatmeal cookies: Preheat the oven to 350°F (175°C). Butter a 12-by-18-inch rimmed baking sheet and line it with parchment paper. In a large bowl, toss together the oats, flour, sugar, and salt. In a separate small bowl, whisk the eggs and vanilla together until smooth. Add the butter and whisk to combine. Pour the egg mixture over the oats. Work the dough together with your hands until there are no dry clumps of oats or flour left in t he bowl. 10. Spread the mixture in an even layer across the prepared baking sheet (as if you were making a tray of brownies). At the shop, we cook them about ½ inch (12 mm) thick so that we can easily chop them into bite-size pieces. Bake for 20 to 25 minutes, until the top is a deep golden brown. Let cool then chop the cookies into small pieces and set aside. 11. Transfer the cooled base to an ice cream maker and churn it according to the manufacturer’s instructions. 12. Transfer the ice cream to a storage container, folding in the oatmeal cookie pieces as your do. Use as many of the cookie pieces as you want; you won’t necessarily need the whole batch. Serve immediately or harden in your for freezer for 8 to 12 hours for a more scoopable ice cream. 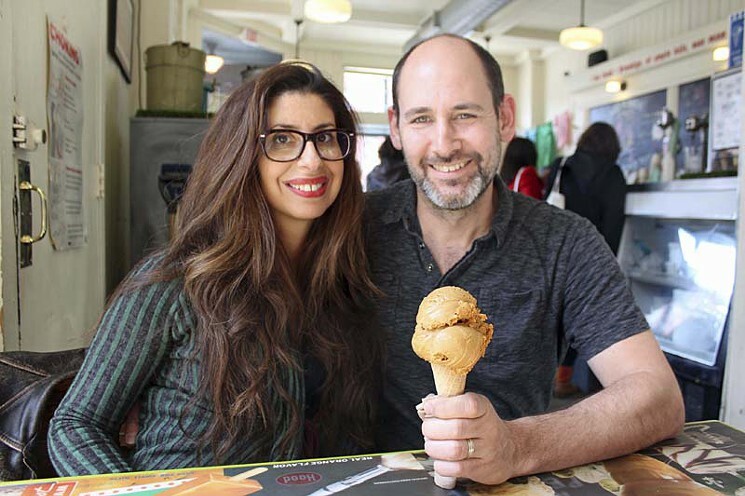 Photo credits: Ice Cream: Brooklyn-Portland.com; Portrait of Jackie & Brian: Bradley Hawkes for The Village Voice. That’s such a moving story! We connect so many memories to the food that we eat and the loved ones that we share our meals with. I really admire how Jackie makes a point to share the story of the lace cookies with their staff so they know the deeper story. Also – the ice cream looks really good! Such a sweet story and recipe, thanks for sharing, Jackie and Jenny. Thank you so much for this recipe. I had this ice cream a year ago in NYC and then my husband ordered some for my birthday but I’m thrilled to be able to recreate it on my own.